Understanding the mechanisms of anxiety is critical in the treatment of anxiety disorders, and thus this page was created to transfer my knowledge to those interested in learning how to manage their anxiety. Long and detailed explanations for anxiety are provided and are meant for clients to read and refer to regularly as we progress through treatment. TIP: Start by reading through the information one section at a time, taking time to take notes, make an outline, or print out the information and review daily until the information becomes automatic. The goal is to practice recalling this information when calm and focused so that you are able to use this information as a way to cope with anxiety even in the moment. Anxiety is a protective mechanism where feelings of uneasiness, concern, and apprehension lead to behaviors that keep us, our loved ones, and our environment safe from harm. Because we are concerned for our own well-being, we avoid a snarling dog. Because we are concerned for our children's safety, we have them wear seatbelts. Because we are worried about our environment, we recycle. Some amount of anxiety and worrying is a normal and necessary part of life and indicates that our internal protective systems are doing what they are supposed to do. 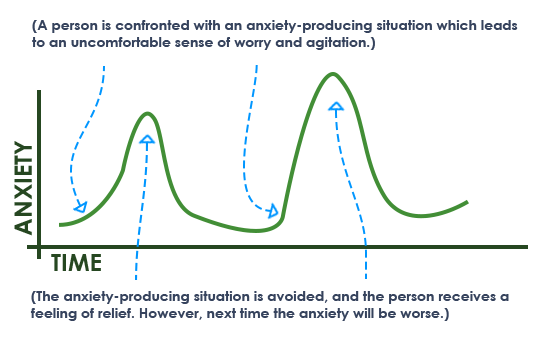 The anxiety response system can be viewed as an evolutionarily adaptive mechanism in that those individuals who feared immediate dangers, worried about the future, and planned protective measures were able to survive and pass on their genes. We are the descendants of the scared and worried - we are the survivors. Not only is anxiety normal, it can be related to positive characteristics. Those with anxiety can be incredibly sensitive to the thoughts and feelings of others. This acute awareness of others and of the environment may lead to anxiety but it is also what leads to compassion. In addition, through the lens of your own struggles with anxiety, you may be better equipped to feel empathy for the struggles of others. Anxious and worrying brains can also be seen as creative brains. This creativity that conjures up worst case scenarios and anxiety provoking images can also be seen as over activity of the part of our brain that generates new thoughts and ideas. It is this creative vision that helps us progress as a society and that creates art, music, and poetry. Anxiety is also related to bravery. Bravery is often defined as the ability to face a situation despite danger, fear, or difficulty. Thus, it's not necessarily that you don't feel fear, it's that you enter a situation despite fear. Anxiety may make you feel weak, but in fact, it is an act of strength and courage that you are able to face situations each and every day that cause you fear. Thus, normal anxiety is protective and can be positive, too. Anxiety disorders develop when levels of anxiety become excessive, inappropriate, or uncontrollable and begin to impair functioning in work, family, school, or social relationships. In many performance situations, such as during a test, a moderate level of anxiety, arousal, or stress is optimal in that it leads to heightened attention, energy, and motivation. If stress levels are too low, there may be apathy or boredom, which leads to poor performance. If stress levels are too high, this can lead to a lack of concentration or a complete emotional breakdown, which too can lead to poor performance. There are some situations where a high level of arousal is desired such as when a ferocious dog is charging towards us, but for the most part, high levels of anxiety lead to high levels of unnecessary distress. Because of their frightening experiences with anxiety, those with anxiety disorders have become uncomfortable with even these moderate levels of anxiety, and treatment often includes re-learning how to tolerate normal, moderate levels of anxiety. The three components of anxiety refer to the anxious thoughts, physical feelings, and behaviors (actions) that are triggered by a situation. By breaking anxiety down into concrete, understandable components, it will not seem like such a vague, overwhelming threat. 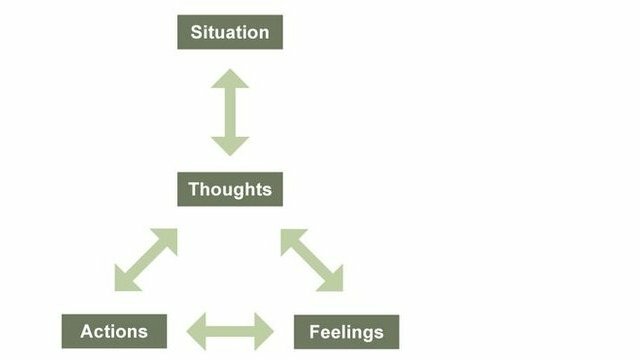 You may even see patterns in your responses to anxiety that give you an understanding of your own cycle of anxiety. Monitoring your anxiety as three components also allows you to step outside of your anxiety, even if for a moment, and view it from a different perspective. This starts the practice of learning to observe your anxiety without immediately reacting to it in habitual patterns of responding. Another benefit of breaking down anxiety into components is that it can help you develop a plan for managing each component so that treatment is not so overwhelming. PANIC EXAMPLE: When an individual is faced with an anxiety provoking situation such as an upcoming flight, he may experience thoughts such as, "I'm going to have a panic attack and won't be able to escape," which leads to physical sensations (feelings) of anxiety such as heart palpitations and sweating, which leads to actions such as pacing or hyperventilating, which further leads to thoughts such as, "Here comes the panic attack. I can't breathe. I'm going to pass out," which then leads to additional physical symptoms (feelings) of anxiety such as dizziness and difficulty breathing which then leads to the action of escape from the airport, which leads to thoughts such as "I knew I couldn't do it. It's too much for me to handle. I'm so weak," which leads to the future action of avoiding airports all together, which leads to future thoughts about fear and failure, which leads to future sensitivity to any feelings associated with anxiety. STRESS EXAMPLE: When an individual is faced with an anxiety provoking situation such as the daily stress associated with employment, there may be thoughts such as, "I'm going to make a mistake. I can't make any mistakes," which leads to physical feelings of agitation and muscle tension, which leads to behaviors (actions) such as checking an email a dozen times before sending, which leads to thoughts such as, "I'm going to look incompetent. My boss will realize I have no business here," which leads to further feelings of heart pounding and sweating which leads to actions such asking colleagues for reassurance or apologizing for mistakes not made yet, and when no reassurance is gained, the anxiety spirals and leads to thoughts such as "I'm going to lose my job. I'm going to be a failure," which can lead to stress symptoms (feelings) such as headaches, insomnia, GI distress. In both examples, the spiral of anxiety becomes a habit that is strengthened with time and repetition so that eventually a trigger can rapidly lead to an anxiety attack or to stress symptoms. The first step in treatment is to identify the situation, thoughts, physical feelings, and actions (behaviors) associated with anxiety. The following descriptions of each component can assist in that process. A situation refers to events or objects that trigger an anxiety response. Some triggers such as snakes, spiders, heights, and water seem to be preprogrammed in our brains so that there is, at the very least, a sensitivity to those objects and situations. Other triggers are learned when a previously neutral or safe situation is paired with a negative event that naturally causes pain, discomfort, or a negative response. 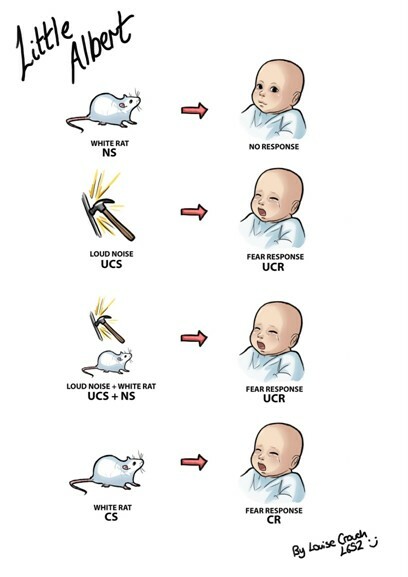 In a classic psychology experiment, a young child who was not previously afraid of rats was shown a rat while being startled by a loud noise which made him cry. Because the rat was paired with the loud noise, eventually just the sight of the rat elicited a fear response in the child. In psychology literature, this is called classical conditioning. For some individuals, there are no readily identifiable triggers to panic attacks. This may be because the trigger is an internal, physiological sensation such as shortness of breath or heart palpitations. A fear of these physiological symptoms may have developed when these symptoms were paired with a panic attack which caused intense fear. Previously, these symptoms may have caused discomfort and unease, but after the initial full blown panic attack, any sensations associated with a panic attack are now met with intense fear. In addition, after having a panic attack, it is common to start hyperscanning the body for even the most subtle physical symptoms that may be associated with a panic attack, so that even the slightest changes in breathing or heart rate can trigger a panic attack. For other individuals, there may not be a specific event that led to a situation becoming a trigger. For example, it is thought that in OCD, the brain spontaneously generated a thought, image, or impulse that the individual interpreted as meaningful and dangerous, which then caused the experience of fear. Therefore, a client with OCD who is afraid of contracting meningitis from touching a door knob may not have had any previous negative experiences with door knobs, but rather, it is the spontaneously generated thought of contamination from door knobs that led to fears of illness and death, which then led to door knobs becoming triggers. TIP: Try to identify the situations that trigger anxiety. On a scale of 0-100 with 0 being no anxiety and complete calm and 100 being total panic, rate how much anxiety you experience in each situation. Then rank them and write them in order from least to worst. "What was I thinking right before I became anxious?" "What am I afraid will happen, and if that happens what might happen, and if that happens what might happen..."
"What is the worst thing that can happen?" "What am I afraid this means about me, the world, or the future?" "What images come to mind when I'm feeling anxious?" It is important to remember that these thoughts are not necessarily wrong or bad, but rather, the brain is rigidly fixated on thinking in a way that is meant to keep you safe from imminent danger. This way of thinking may have been adaptive in the past, may have been learned from childhood, or as in OCD may seem as if it is neurological in nature. When you consider how they developed, the thoughts often make sense. The problem is that if anxious thoughts continue even after the situation is safe, a false alarm will continue to sound, keeping your mind and body in a state of anxious arousal. This emergency mode that was once life-saving in dangerous situations becomes an obstacle for day-to-day living. TIP: Try to become aware of the thoughts that you are having when you are feeling anxious. Write them down and become familiar with them. For many people, when faced with an intensely fearful situation that the mind perceives as dangerous, the understandable reaction is escape or avoidance. Individuals struggling with anxiety disorders may escape from or avoid all together situations such as elevators, classrooms, airplanes, public bathrooms...anything that causes anxiety. Other avoidance behaviors can include drinking alcohol to avoid feelings of anxiety or performing compulsions to escape the feelings of anxiety. Anxiety can also lead individuals to engage in safety behaviors such as only driving with a companion or never leaving the house without anxiety medications. Another common coping behavior is reassurance seeking where individuals may seek the reassurance of family, experts, or the internet about their fears. Every time a situation is avoided, an opportunity to build new connections in the brain and to create a new learning experience is missed so that individuals are left walking around with a high level of general anxiety and anticipatory anxiety in fear of future anxiety provoking situations. Imagine that you are walking through a jungle, and suddenly, a tiger pounces in front of you. Luckily, your body is equipped with an instinctual, safety mechanism that rapidly prepares itself for action in the face of danger. Your body has already set off its protective emergency response system before you were even fully aware of the danger in front of you. This is the "fight or flight" response which evolved as a way to either fight the source of danger or take flight away from the source of danger. When the fight or flight response is engaged, the primitive and reactive parts of our brain immediately send messages to the rest of our body to create powerful emotions and physical reactions that are difficult to ignore, thus, ensuring our safety. It is important to remember that the purpose of this anxiety response is to protect us from danger, and anxiety is necessary to keep us safe and aware of the challenges ahead. The flight or fight response is initiated by the part of our brain called the amygdala (more on that later). The amygdala responds immediately by sending an alarm to the rest of our body which leads to the activation of our sympathetic nervous system. The sympathetic nervous system is part of the autonomic nervous system, which controls functions in our body that our essentially automatic and outside of conscious awareness such as heart rate, respiration, and digestion. The heart beats faster, pulse rate goes up, and blood pressures increases so that our muscles, heart, and vital organs receive the extra blood and oxygen needed to fight or flight. If we are sitting in our cars and not running away from a tiger, our activity level is not matching the increased activity in our bodies, and we experience these symptoms as heart palpitations or chest pain. Blood is redirected to our essential organs by the constriction of blood vessels in places like our fingers and toes so that our extremities may feel cold and tingly during an anxiety response. Digestion slows down and immune responses decrease so that our body can conserve energy for more essential bodily functions needed for fight or flight. This can lead to an upset stomach or feelings of nausea. Respiration also increases in preparation for the extra activity. If no extra activity occurs, we are basically over breathing, or breathing more than is necessary for what we are doing. This over breathing can lead to hyperventilation, which in turn can lead to chest pain, feeling smothered, dizziness, blurred vision, confusion, dissociation from reality, and hot flushes. Going crazy is unlikely as a major mental illness such as schizophrenia has a gradual onset and does not occur suddenly as in a panic attack. Those with schizophrenia also show mild symptoms of the disorder throughout most of their lives and until it manifests in their teens or early 20's. Thus, if an individual has not shown symptoms of schizophrenia by this time, it is unlikely to he will become schizophrenic suddenly. An interview with health professionals would also have indicated schizophrenic tendencies if they did exist. Losing control often means becoming paralyzed, running around perhaps yelling obscenities, or a vague feeling of something bad happening. The activation of the sympathetic nervous system makes it highly unlikely that an individual would become paralyzed during a panic attack. The sympathetic nervous system, though, is likely contributing to those feelings of confusion and dissociation. Even so, you are still able to function normally so that often times those around you are unable to tell that you are having a panic attack. A fear of passing out comes from the fear that the sympathetic nervous system will continue to spiral out of control, but in reality, the parasympathetic nervous system is in place to prevent this from happening. The likelihood of passing out is extremely unlikely especially if it has not happened before. If you do pass out, then the sympathetic nervous system will cease and you would gain consciousness. The fear of dying is often associated with the fear of having a heart attack. Unlike a panic attack, pain associated with heart disease is often directly related to physical exertion and the physical symptoms often subside quickly with rest. On the other hand, panic attacks often occur when at rest and do not subside quickly. When symptoms occur at various times and not only during times of physical exertion, then it is likely due to anxiety and not heart disease. Finally, if you have had an EKG and your physician has not identified signs of heart disease, then it would be safe to assume that you do not have heart disease. Once the sympathetic nervous system has been activated and adrenaline has been released into the blood stream, it can take some time for the physical symptoms to subside. The anxiety response eventually diminishes when the adrenaline in the blood stream is used up or is destroyed by the body, or when the parasympathetic response kicks in. As compared to the sympathetic nervous system, the parasympathetic nervous system is a slow acting, dampening system that counters the effects of the sympathetic nervous system by promoting a relaxed feeling. The parasympathetic nervous system has been referred to as the “rest and digest,” “tend and befriend,” or “feed and breed” system in that it is associated with behaviors that occur at rest. The parasympathetic nervous system works to prevent the anxiety response from spiraling out of control. It is important to note, though, that the anxiety dampening system takes time to engage, meaning you may feel on edge for some time after the sympathetic nervous system has stopped responding while the chemicals continue to float around in your body. This is thought to protect our bodies by keeping it in an alert state in case the source of danger returns. The sympathetic and parasympathetic nervous system responses were likely developed to protect our bodies from immediate life threatening dangers, but in modern times, threats come in more complex and subtle forms. Therefore, instead of the tiger in the jungle, we may now fear heart palpitations that may trigger a heart attack which may trigger death which may cause our children to be left without a parent. The same response is triggered whether we see an actual tiger or whether we perceive in our minds a threat to our livelihood. With an actual threat, our bodies fight or flee which uses up the energy released by the sympathetic nervous system. With a perceived threat, the body remains idle and thus chemicals from the sympathetic nervous system remain active in the body. This leads to the persistent and uncomfortable symptoms associated with anxiety attacks. Rather than feeling protected, we are left feeling exhausted, fearful, and uncomfortable. Fortunately, you can learn to activate the parasympathetic nervous system by engaging in activities that make you feel at ease. Click here for more thorough information regarding panic attacks, panic disorder, and treatment. Click here for a more thorough explanation of the biological components of anxiety. These breathing patterns can further contribute to uncomfortable symptoms of anxiety, which can lead to anxious thoughts about the symptoms, which can then lead to more anxiety. In addition, when we experience chronic stress, we may be consistently hyperventilating on a small scale, leaving our bodies vulnerable to a panic attack. A study by Meuret et al (2011) showed that for those who experienced "out of the blue" panic attacks, significant changes in their breathing and heart rate occurred a full hour before their panic attack, and that these symptoms were largely outside of conscious awareness. Wilhelm and Trabert (2011) also showed that individuals with panic disorder evidenced instability in measures of respiration even at rest. These findings point to the importance of stabilizing respiration in those who suffer from panic attacks. Because of the relationship between breathing and anxiety, many treatments for anxiety disorders involve breathing retraining. Breathing retraining refers to teaching clients how to breathe from their diaphragm, or from their bellies, vs their chest. Breathing retraining also involves learning how to slow the breath cycle to about 6 breaths per minute, or 10-second breaths. Often, this can be done by imagining breathing through the nose (smelling the flowers) and then breathing out through pursed lips (blowing out the candles) and imagining that you are breathing into your belly, filling up a balloon that expands and pushes up your belly. It is important to note that there have been mixed findings regarding the efficacy of breathing retraining in the treatment of panic disorder. This may be because "correct" breathing becomes another source of anxiety or the breathing is used as a way to stop or control a panic attack that has already been triggered. It is important to remember though that the key to treating panic disorder is learning to tolerate the uncomfortable physical symptoms associated with anxiety and to learn that they are not harmful, can be tolerated, and will pass. Therefore, when implementing this strategy, it is important to use it as a preventative measure that decreases overall physiological arousal to reduce the likelihood of panic attacks but once a panic attack is triggered, the breathing should be used as way of sitting with the anxiety and allowing it to pass. Click here for more information about breathing and anxiety. Over thirty years of scientific research has supported the efficacy of cognitive behavioral therapies in the treatment of anxiety disorders, but it is only recently that technological advances have shed light on the neurological explanations for how anxiety disorders develop and why cognitive behavioral treatments are so highly effective. An understanding of the brain can be extremely helpful when learning to manage uncontrollable, excessive anxiety, and therefore, this section will attempt to describe in general the brain mechanisms related to the experience of anxiety. Our brains control our thoughts, feelings, and behaviors, but changing the way we think and changing the way we respond can also change brain structures and patterns of responding in the brain. This is referred to as neuroplasticity. Being stuck in inflexible patterns of thoughts and behaviors are the problem in anxiety disorders, but by practicing new ways of responding to fearful situations, brain circuitry can be rewired to respond more flexibly to situations that cause anxiety. Old patterns do not necessarily disappear, but rather new circuitry, new patterns of thinking, and new ways of responding are strengthened while old habitual patterns are weakened creating more flexibility of choice. The amygdala is an almond-shaped structure in the brain found on each side of our cortex. The amygdala is responsible for the physiological component of anxiety in that it initiates the fight or flight response in the rest of the body. Without the amygdala, we would not be able to have a fear response, and in fact, studies have shown that animals and humans with compromised amygdala functioning no longer have normal, adaptive fear responses to dangerous situations. On the other hand, those with a genetic vulnerability to having a sensitive amygdala may exhibit strong fear responses to any sign of danger. When the amygdala senses danger, it acts as a protector and seizes control of our thoughts and behaviors so that we are focused on responding to danger. It sends an immediate alarm that can be automatically activated even before we have had time to think. This is why we can jump out of the way of a car before our thinking brain has even registered the danger. The amygdala makes rough assessments for a quick anxiety response, which is adaptive in emergency situations, but may lead to inaccurate, false alarms. In dangerous situations, though, it is better to be safe than sorry. Once the amygdala has initiated a fear response, it takes time for the body to settle down, even if the threat is no longer present and even if we tell ourselves that we are safe. This means that we may need to ride out the experience while trying not to ignite a secondary fear response. The amygdala appears to respond in a preprogrammed way to certain fears such as snakes, spiders, and heights, but fears can also be learned. Amygdala activation appears to be necessary to learn new fears, and the way in which the amygdala learns seems to be through experience, not logic, and through pairings or associations. Thus, the amygdala is the brain structure involved in the classical conditioning of fears. The amygdala can learn to fear a situation if it is paired with a distressing anxiety response and afterwards may continue to automatically send out an alarm response in error even if the situation is no longer dangerous. To learn a less fearful response to a trigger, the amygdala must be activated and then presented with a new learning experience where there is no danger despite uncomfortable, distressing feelings of anxiety. Techniques to Calm the Amygdala: Though some people seem genetically prone to having overly sensitive amygdala responses to danger, there are still techniques that can dampen the amygdala activation system. Diaphragmatic breathing, aerobic exercise, and yoga can lower the intensity of the amygdala response. Regular aerobic exercise, yoga, and adequate sleep are also helpful in decreasing the overall sensitivity of the amygdala response. For long term rewiring of the amygdala circuitry, the most effective intervention is repeated, prolonged exposure to the feared events, objects, experiences, or memories without any dangerous outcome. As described above, sensory experiences (sights, sounds, smells, tastes, physical feelings) can travel directly to the amygdala immediately igniting an anxiety response even before we have had time to think about what we've experienced. The part of the brain that does the thinking or the interpreting is the cortex. The cortex is what people typically think about when we think about the brain. It is the thinking brain, the logical brain, the planning brain. It is the part of the brain involved in obsessing, worrying, ruminating, and dwelling. The pathway from our senses to the cortex and then to the amygdala is slower and more thoughtful than the pathway straight to the amygdala. The cortex takes in information from our environment and interprets the world around us, and if it senses danger, it can send information to the amygdala which can then activate the fear response. For example, while on a hike if you see a long, slender shape on the path, the amygdala immediately makes a rough assessment of the situation and interprets this threatening shape as a snake (better safe than sorry), and the body reacts automatically by jumping out of the way before the cortex has had time to register the shape as a stick. Once the cortex interprets the object as safe, it sends a message to the amygdala but the amygdala response takes some time to terminate and furthermore adrenaline has already been dumped into your body system. Thus, the anxiety response may continue for several minutes to an hour depending on the initial level of amygdala activation. The cortex is also capable of igniting anxiety by generating its own thoughts and images without any stimulation from the environment. Worries and obsessions are essentially being created from within the cortex itself. The cortex also has the ability to dwell and ruminate on these thoughts and images, whether they are real or not, which then activates the amygdala which then activates the fear response. The cortex can also plan ahead and foresee anxiety provoking situations in the future which leads to anticipatory anxiety. In addition, the cortex can worry and ruminate about fearful situations in the past. In a sense, the cortex is capable of worrying about the past and the future, scaring the amygdala in the present. Techniques to Calm the Cortex: As with the amygdala, neuroplasticity is seen in the cortex, meaning it is capable of change. The cortex responds to education, reason, logic, debate, and experience, and thus fears can be explored and challenged and new beliefs can be developed and practiced. The most effective way to rewire the circuitry of the cortex is to practice thoughts and interpretations that allow for a new, stronger, pathway to be developed in the brain. This is referred to as the “survival of the busiest,” where the circuitry or pathway in the brain that is used the most becomes the strengthened whereas those that are not being used as much become weaker. Therapy techniques that might help rewire the cortex (the thinking brain) are those that identify and challenge thoughts and interpretations that induce anxiety. Logical approaches that use scheduling, planning, and problem solving also seem to help calm the cortex. Understanding where these beliefs came from can also help diffuse some of the power behind the thoughts. For some, the cortex may have fallen into the habit of generating anxiety provoking thoughts and then gets stuck on this “anxiety channel,” which activates the amygdala. The realization that these thoughts are not dangerous and are not productive and that it is not helpful to listen to these anxiety provoking messages can provide great relief. Mindfulness techniques can help to develop the ability to allow thoughts to pass by so as to not activate circuits that induce anxiety.